"On Monday, the water will be up to here," said Busu village resident Steven Hari, pointing to a high-tide mark in the sand, roughly 2 meters from the current shoreline of his island home. In two days, the tides are predicted to swell and almost reach a small, thatched-roof hut, closest to the coast. "Climate change is definitely affecting our community," Hari said. Busu is one of many remote villages built on artificial islands situated along Langa Langa Lagoon, in the northwest of the Solomon Islands' Malaita Province. Walking around his village, Hari explains that parts of his island have been lost to rising sea levels, including large swathes of beach -- "maybe three or four houses wide" -- which previously protected the land from erosion during storm surges. "And this area here," Hari points to a mound of grapefruit-sized stones and dead coral, closer to the shore. "We need (to use these) to build the island higher so the water won't come in." For generations Langa Langa residents have collected stones and corals from deep in the lagoon to build their manmade islands, but recently, the materials are being used to reclaim land and build sea walls to prevent erosion caused by strong waves washing onto shore. Now the lagoon is running out of stones and Hari is aware his village is surviving on borrowed time. "We are also killing the fish when we take the stones because that is where they feed," he said. Roughly 2,800 kilometers northeast of Sydney, Australia, the Solomon Islands are an archipelago consisting of almost 1,000 islands and low-lying atolls. It's also a nation that is experiencing some of the highest rates of sea-level rise in the world. Each year the oceans surrounding the Solomons rise 8-10 millimeters -- almost three times the global average. In 2016, researchers from the University of Queensland in Australia found the high rates of sea-level rise in the Solomon Islands had already claimed five uninhabited islands. Although the research concluded that the unusually high rates of rise are partly caused by natural phenomena like El Nino and La Nina cycles, climate change also plays a considerable role. "We've been cautious to stress that anomaly is partly a result of human-induced climate change and partly natural, but the key point is that rate (of sea-level rise) within the Solomons is exactly what the human-induced rate will be towards the end of the century," lead researcher Simon Albert said. "Regardless of what is the cause, the consequences are the same as what the whole world will face," he added. While the effects of climate change may be a distant future for some, for Melchior Mataki, a senior official in the Ministry for Environment, climate change in the Solomon Islands is as real and immediate a threat as any war or conflict. "We're talking about peoples' lives," Mataki said. "Climate change has the same potential (for destruction as war). It may not occur now, but (it) may be killing us slowly and surely and softly." For Mataki, climate change magnifies the challenges a developing country like the Solomon Islands already face, such as poor infrastructure and limited resources. "(With sea-level rise) local food production becomes severely hampered and staple crops like taro cannot be planted because the earth is too salty," he explained. "We are a country of islands that are widely fragmented and dispersed, so we are not able to reach (remote villages) in time to attend to their needs," he said, referring to the food and water relief programs his department is also responsible for. Salt water intrusion into fresh water supplies and gardens is already a reality for Busu village, which used to grow bananas and sweet potatoes in gardens on the mainland. But for the past five or six years, residents have instead made the 10 km boat journey into the nearest town of Auki everyday to buy food supplies, while rain water tanks donated by the Australian government have replaced a local fresh water well, built roughly 150 years ago, that has become too saline to use for drinking water. 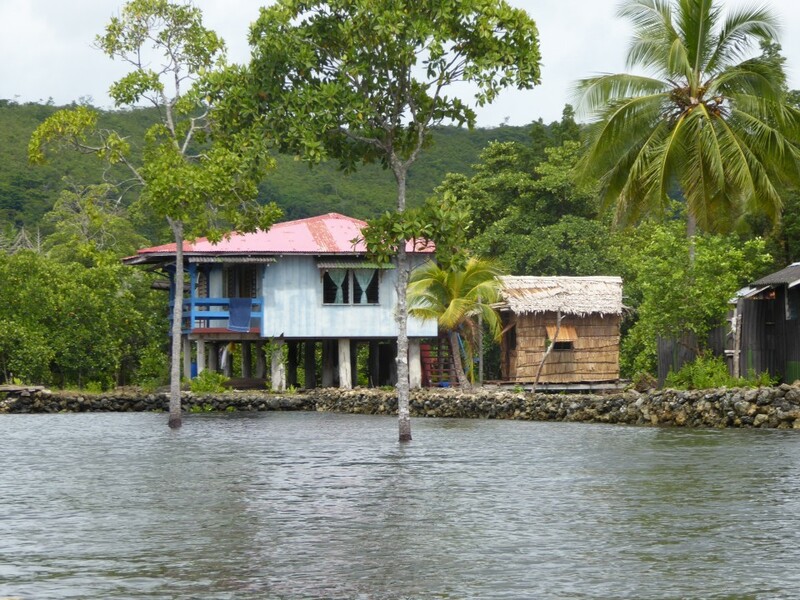 The issue of rising sea levels in the Solomon Islands is further complicated by the country's land ownership system, where territory is passed down within families or communities, making internal relocation an unlikely solution. Radefasu village, for example, is also situated on Langa Langa Lagoon, but is connected to the Malaita mainland and backs onto a hillside. 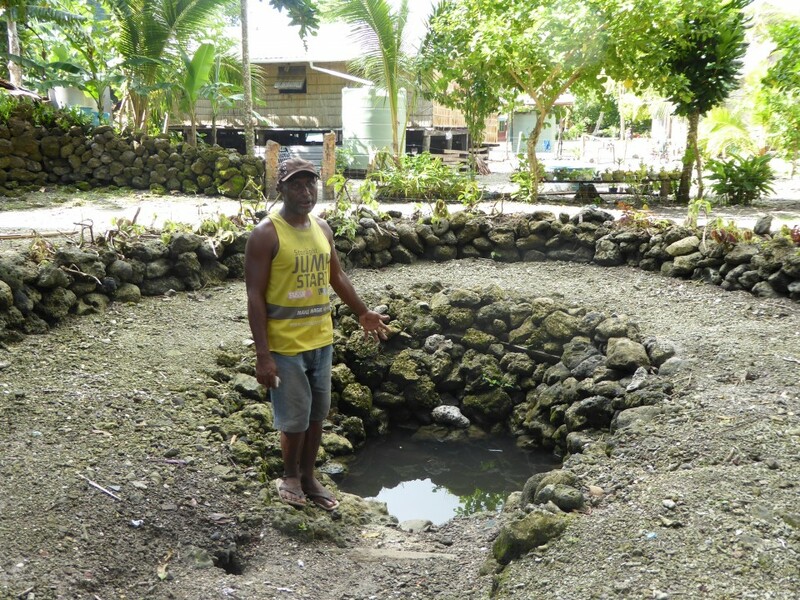 Although the community has been diligently rebuilding their sea walls as recently as three months ago, heavy rain and king tides cause a nearby river to flood. Flood waters reaching mid-thigh height force families to evacuate into the surrounding hills behind the village. However, the community cannot relocate permanently because the hills belong to a different community group. "Resettling in a new area would be hard. We are water people and most of us are fisherman so the further we move inland the harder it is to survive," said Radefasu resident Robert Samare. "But if the people could move, we would already do it." As representatives to the United Nations gather from this week in Germany for the 23rd session of the Conference of the Parties (COP 23) Climate Change Conference, Solomon Islanders are hopeful that the international community will commit to help stop climate change. Mataki, who will also be attending the U.N. conference, said the withdrawal of the United States from the Paris Agreement in June came as a disappointment, because all nations need to come together in order to help communities like Busu and Radefasu, in the Solomon Islands. "The U.S. has made its position known that they intend to withdraw (from the Paris Agreement), and they have the right to do that, it's their choice," Mataki said. "But for a country like ours, which is at the forefront of facing the impacts of climate change, what we need is commitment." As for the locals in Langa Langa Lagoon, Samare from Radefasu village has just one message for the international community: "Save our souls."